When you begin a new exercise program, muscle soreness or muscle stiffness occurs during the day or two after exercise due to lactic acid production in your muscles. This temporary discomfort is a natural part of your body's natural muscles rebuilding process. Muscle soreness is a normal part which leads to greater stamina and strength of muscles building for a bodybuilder. It’s better to change your exercise routine or intensity for a limited period because this pain can causes swelling or bruising. This pain depends on how hard and how long you exercise and what type of exercise you do. It is not an easy way to treat delayed onset muscle soreness DOMS is the result of injury to your muscle fibres caused by excessive or new exercise. But some natural herbs treatments found helpful to prevent and cure from this discomfort after an exercise or a new weight training routine. Certain muscle pains can be the sign of serious muscle injury, its better to consult your physician if you feel severe pain or soreness. Cherries are found anti-inflammatory, and may also help reduce your uric acid level. Cherries are also very effective to help with conditions like arthritis and gout, and may have some usefulness for general muscles pain. Cherry juice very much effective to reduce muscles pain for long distance runner. Anti-inflammatory properties of watermelon helps to relieve muscles soreness and blocks the activity of the pain and inflammation naturally. Best to eat it prior to each workout or one hour after any food in a limited amount for a better digestive system and healthy stomach. The amazing spice which known as healing compound which reduces inflammation in joints and pain. Turmeric boiled in milk has very much effective for arthritis. Drinking honey with lukewarm water is the best and easy solution to get rid from any kind of body muscle pain. Mix well 2 tablespoons Honey in 1 glass lukewarm water and drink it. Muscle pain due to tiredness will go away within few minutes. Mix 1 teaspoon Nigella seed (Kalonji) Oil in 1 cup of warm milk and sip it like tea. Or massage on affected by Nigella seed oil best for muscle tiredness, tightness of the muscles and pain. Milk Shake with Banana, Ajwa Dates found very effective to get relief from muscle soreness, swelling and pain. Also very much effective shake for beginners. Ginger Tea is also found a natural pain reliever and effective to reduce muscles pain and soreness naturally. Keep your body from dehydration during physical activity. Dehydration can be the cause of your muscle tightness. Having a warm bath by adding Epsom salt in your bathtub found very much effective to get relief fast from muscle pain. Getting good and relaxed sleep for 7-8 hours is very much important to allow your body to produce growth hormones which results in the tissue healing and repair. Alkanet Root (Ratanjot) 10 grams, Cinnamon (darcheni) 25 grams, Cloves loong) 10 grams, Dried Ginger Powder 25 grams, Mace (javitri) 10 grams, Nutmeg (jaifal ) 2 Pcs., Sesame Seeds Oil 250 grams, White Turmeric 25 grams. Grind all the ingredients to make a powder. Heat the oil in a pan, when the oil heat up mixes the powder in it with a wooden spoon. After boiling it on low flame for 4-5 minutes off the flame and place it to cool. Filter the oil and preserve it in a glass bottle with a tight lid. Massage with this oil smoothly on affected area and cover it a heating pad or warm woolen cloth. You will feel relaxed within few minutes effectively. Almond Oil 100 grams, Pumpkin Seed Oil 100 grams, Nigella Seed Oil 100 grams, Cloves 25 grams. Put all the ingredients in Copper Pan and put it on low flame. Leave it until cloves turns into black then off the flame. Mash and mix cloves in the oil and leave it to cool. Keep it in a bottle. Massage the affected area to soothe tired muscles within few minutes. 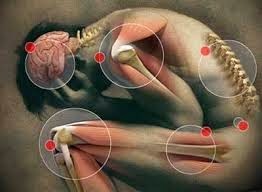 To keep your body muscles from pain massage with it daily before going to bed.